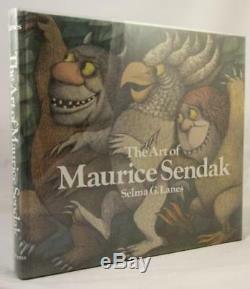 The Art of Maurice Sendak by Selma G. Book Condition: Fine - Sharp tight copy. Dust Jacket Condition: Fine - Sharp clear dust jacket. Features: Signed and inscribed by Artist to noted book collector Charles Collins. Includes an invitation to Brentano's Annual Costume Gala, illustrated by Sendak, #133/800. Please pay very close attention to our grading guide because we are very specific and the condition of a pulp or magazine can be critical to its value. Although we are not perfect, we are very proud of our grading and strive to become the grading standard of the internet. When grading pulps we identify a grade which includes the cover, spine, and back cover. Then we describe the paper quality from off-white to brown or brittle. For lower grade pulps in lots or regular magazines (which don't have the same paper quality problem) we don't usually describe the paper quality unless there is a significant problem. In general, regular magazine paper is usually a supple cream to tan. VERY FINE-(VF): Appears almost like new with high color gloss. It is a flat, tight book with no or almost imperceptible cover creases. The overhang may bend and have a few very small creases or tears but none large enough to affect visual appearance. FINE-(FN): A sharp copy with minor defects. Very minor tears, a minor 1/8 inch chip out of the overhang. A flat tight book that may be similar to a VF but doesn't have that freshness or gloss. VERY GOOD-(VG): A copy with a number of milder defects. Mild creases with very small chips from the edges. At this grade the edges are starting to have numerous small tears and creases. Minor wrinkling and small pieces of the spine may be missing. Mild fading and could have some tape on the spine. GOOD: A worn copy, typical of an older magazine. Numerous defects including more severe creasing, fading, wrinkling, and/or larger chips from the cover and the spine may be taped. FAIR: A very worn copy, our lowest grade. This grade may have defects that include large pieces out of the front cover, a missing spine, and significant soiling but still readable. 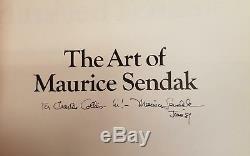 The item "The Art of Maurice Sendak by Selma G. Lanes Signed, First- High Grade" is in sale since Sunday, January 1, 2017.